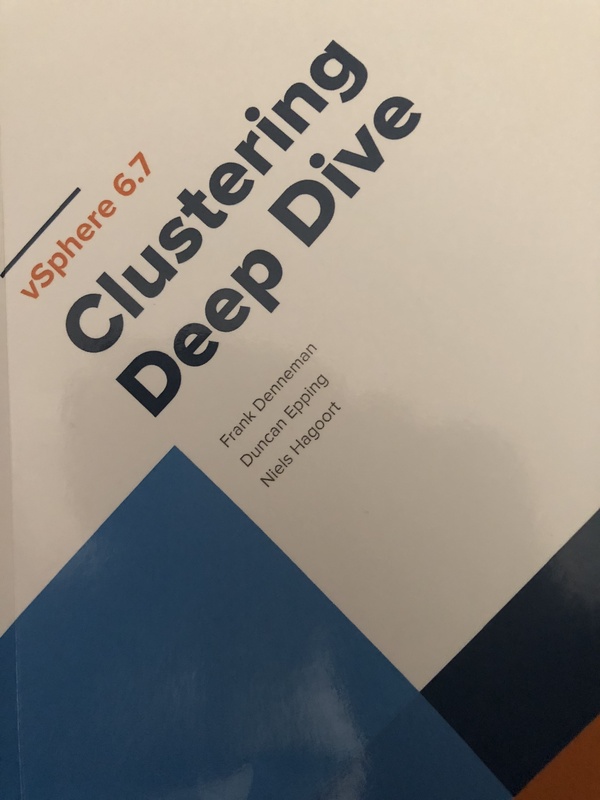 When the book arrived, I dove in head first with the same high expatiations as I had with VMware vSphere 4.1 HA and DRS Deep Dive and vSphere 5.1 clustering deep dive books. The book is well written with excellent diagrams as expected; there was much review throughout the book making this faster read for those that have read other cluster deep dive books. The amount of review is necessary, so everyone is on the same page. With that said there are many changes in both vSphere 6.5 and 6.7 and this book covers the changes in a magnificent manner. I am going to go over a couple of favorite new features, and couple items learned along the way. New initial placement for VM workloads and DRS. vSphere 6.7 DRS algorithm no longer use the snapshotting method that its predecessors used. Older versions of vSphere would take a snapshot of utilization of hosts and compare them for initial placement. DRS could cause an issue when multiple VM’s where being placed at once, multiple VM’s would land on a host that had most resources before next snapshot of resources could take place. vSphere 6.7 kept update performance metrics this allowing VM’s to place faster and distributed more evenly. Over the last couple of years, I have had many conversations with a wide array of customers about DRS. The general consensuses were that at 10 GBE the cost was minimal for the network but never had a definitive answer on the other costs like CPU. The cost for 1 GBE is 30% reservation on a pCPU core and 100% reservation 10 GBE on both the source and destination host. If you are using encryption with vMotion you the costs are even higher. Conversation on vMotion and CPU usage has been centered on CPU %, not around the reservation of a CPU core. With the SDDC having vSAN and NSX adding CPU overhead you should pay attention metrics like CPU RDY% and CO-STOP% and set DRS to aggressive (Level 5) for VM happiness and keep host within 5% utilization of each other. Avoid additional vMotions that will happen if turn on advanced options unless you have a business requirement to do so. One final note KB 2108824 for 40 GBE this means that three cores run with a 100% reservation on them. Yes at 36 GBE a vMotion operations should take an only few seconds. With End of General Support for vSphere 5.5 approaching quickly, here is quick note that might help get upgrades moving faster. The VM memory overhead on VM’s can be reduced by up to 8x when moving to 6.x. Stretch clusters section is an impressive display of architectural review of stretch clusters from vSphere clustering standpoint. I want everyone to read this section more than once. Not only did I learn something about stretch clusters, but it also shows you how something as simple as vSphere clustering that has VCDX defense written all over it. In closing it was worth the time and effort to read this book Frank, Duncan and Niels did a great job. Back to the basics EVC with an extra twist. Everyone should all be aware of KB 1003212, and EVC has not changed over the years, but the acceptable terminology has changed over the last decade. One of the things I keep hearing questions about is can you do vMotion between processor families? Recently over the previous five years, Intel has started calling their processor’s generations, families like Skylake family or Haswell family. Families for EVC don’t equal Intel Families. VMware EVC covers multiple brands of microprocessors both Intel and AMD, for EVC family equals either Intel or AMD. 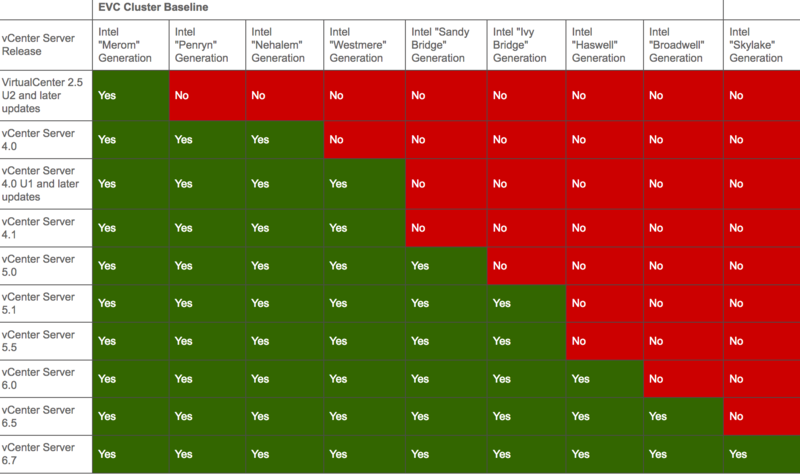 You can not do a vMotion between Intel Family and AMD Family you can vMotion with correct EVC configuration between Skylake, Haswell, Ivy Bridge, ETC, referred to generations of Intel chipsets. The extra twist is with spectre meltdown if you have patch your hosts to 5.5, 6.0 hosts for spectre meltdown and you’re trying to do vMotion to 6.5 be aware that your destination hosts need to patch to a level that supports specter meltdown. Another question that been bubbling up is support for Skylake, EVC will only be support for 6.7 and above. EVC enabled at the L5 level “Ivy Bridge” this means that you can vMotion a VM from hosts or clusters that have EVC mode enable at L0-L5 levels. The reason is that CPU instruction sets for L0-L5 are visible to ESXi. EVC enabled at the L7 level “Broadwell” this means that you can vMotion a VM from hosts or clusters that have EVC mode enable at L0-L7 levels.